I am always looking for time saving ways to get things done. 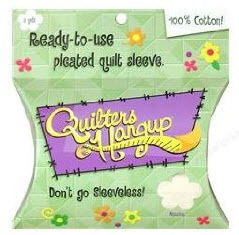 I've tried on numerous quilts in the past to make an even hanging sleeve but for some reason, I end up having issues. It's not very often that I need to add hanging sleeves to my quilts. 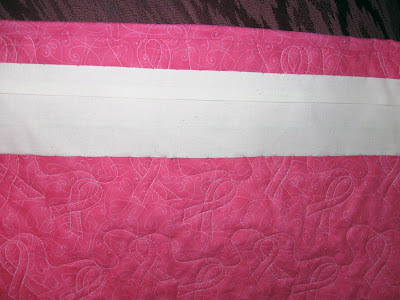 However, I just learned that the Breast Cancer Quilts needed to have hanging sleeves added to them in case they went to local hospitals to hang in honor of Breast Cancer Month. So, last night I added the Quilters Hangup hanging sleeves to both the quilts. I first adhered them with Lite Steam-a-Seam2 and then I hand stitched the edges just to make sure the weight of the quilt did not separate the sleeve from the quilt. Here is the prepackaged hanging sleeve and the results on one of the quilts.